Teaching young piano students the concept of rubato can sometimes feel like teaching a wrestler to ballroom dance. But… Dancing with the Stars does it… and so can you! With a few tricks up your sleeve your piano students can be playing with molto espressivo… leaving the robotic-like performances behind! I always teach with the end in mind. Why leave the juicy stuff until they’re older? Your piano students spend a long time being “young piano students” and this is some serious learning and practicing time. Young piano students don’t need to simply play the right notes either forte or piano… they can learn to play with a sense of rubato, and with a wide range of dynamics too! … They just need to learn to listen. 1) Purchase any puppet that has an easy to open mouth. Introduce your Puppet as Rubato Roberto… or Roberta. 2) Rubato Roberto loves to “sing” (open and close his mouth). At the first introduction have your piano student operate the puppet while you play a piece at your own level. Ignore rubato for now, you just want an inspiring and fun piece of music. Your piano student’s only job is to help Roberto sing along. Attempt to teach them to open and close his mouth along with the music as though he were singing it. Fast music = fast and small opening… Slow music = slow and wide opening. 3) Once your student’s puppetry skills have reached the point of where they can match tempo with “singing” then it’s time to introduce Roberto to rubato. Find some great recordings of either applicable piano or orchestral music and spend time with your student teaching Roberto to sing along. You’ll be amazed at how quickly they learn to switch between fast/small openings and slow and wide as the push and pull of the music dictates. This visual image will then help when it comes time to apply rubato to their own playing. Those of you who have been used to teaching rubato with terms like “robbing time”, “push and pull” and “stretched and contracted tempo” may find this way of teaching to be a bit out there. But work with me here. Kids learn by doing… and until you can do rubato it’s a hard concept to understand. It either works or it doesn’t. Asking a young piano student to push and pull the tempo or to use rhythmic freedom is too complex of a request. Until they can feel it, it’s all just words. Learning to play rubato requires your student to listen as they play; the connection between ears and movement has to be there. Using a puppet engages their kinesthetic and visual senses as they learn to both listen and move their body. For young children this is a significantly complex ability. Most piano students are completely engaged in the visual aspect of playing the piano… aural awareness is something that often just comes with age; but it doesn’t have to be! 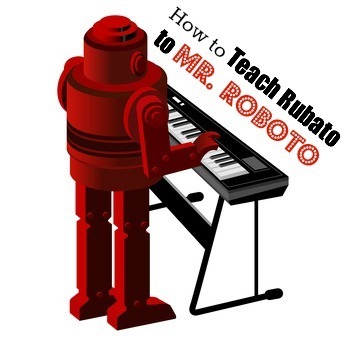 So… adopt your own Rubato Roberto and watch your student’s musicality blossom! Looking for more ways to turn your piano students from ordinary to extraordinary? Our practice book “Shhh… Your Piano Teacher Thinks This is Practice” encourages students to think about their pieces in non-typical ways. Strengthen your student’s musical ability AND practice skills all with one resource. Check it out here.